Britt Robertson at the Fashion's Night Out at Macy's Herald Square in New York. Britt Robertson and designer Tommy Hilfiger at the Fashion's Night Out at Macy's Herald Square in New York. 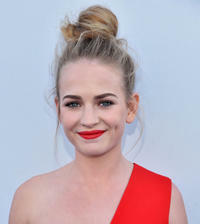 Britt Robertson at the 2012 CFDA Fashion Awards in New York. Britt Robertson at the Teen Vogue's 10th Anniversary Annual Young Hollywood party in California. Britt Robertson at the Tommy Hilfiger Women's Spring 2013 fashion show during the Mercedes-Benz Fashion Week in New York. Britt Robertson and designer Tommy Hilfiger at the Tommy Hilfiger Women's Spring 2013 fashion show during the Mercedes-Benz Fashion Week in New York. Britt Robertson as Aubrey Miller in "The First Time." Britt Robertson as Aubrey in "The First Time." Britt Robertson at the California premiere of "The Longest Ride." Britt Robertson at the California world premiere of "Tomorrowland."